We’re up to our ears in summer fruit…and summer fun. More sleep, more swimming, more reading, more resting. 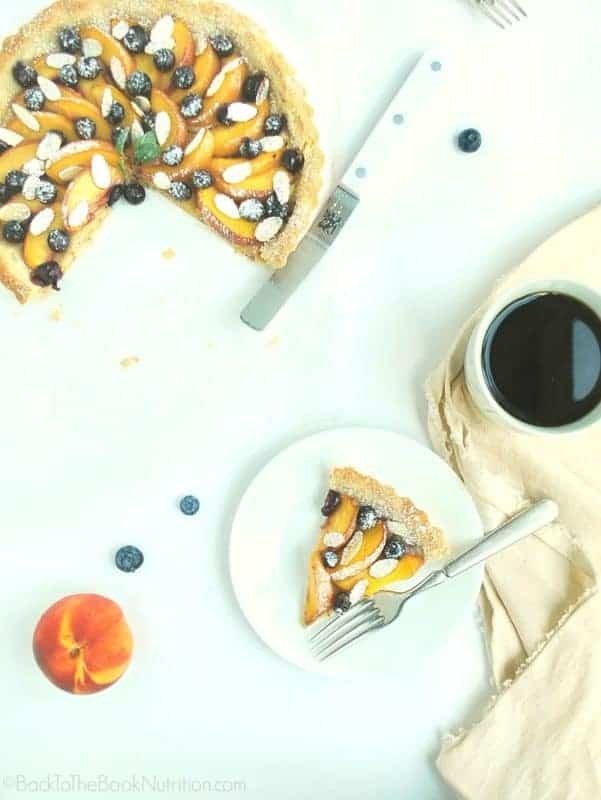 Over the weekend I whipped up an impromptu fruit tart to go with our second pot of coffee. It just seemed like the right thing to do with the piles of perfectly ripe peaches and blueberries filling our fridge. We love from-scratch muffins or breakfast pastries made with *real* flour (this Einkorn flour and this white flour are my favorites for baking!). But, since one family member is still on the GAPs diet, I went the almond flour route (I LOVE this superfine almond flour!). But you know what? This gluten free, grain free version was nearly as good as the real deal. Seriously, we couldn’t get enough! In fact, we ate it again for dessert later in the day, topped with homemade vanilla whipped cream. A scoop of vanilla ice cream would have been even better! Alas, only a tiny sliver was left on Monday morning so, I just *had* to make a fresh one so I could take some pictures and share the recipe with you. Mix almond flour, coconut flour, and sea salt in food processor. Add cold butter and pulse until course crumbs form. Add egg, maple, and vinegar, and mix until a moist dough forms. Press into a 9.5 inch tart pan, place on a baking sheet, and bake for 10 minutes or until crust just begins to brown. While crust is baking, place peaches and blueberries in a medium mixing bowl. 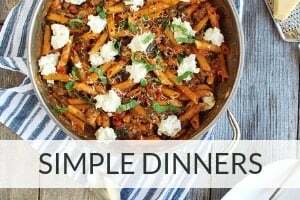 In a small bowl, stir together the maple syrup, melted butter, and vanilla extract. Pour over the fruit and use a spatula to gently combine. 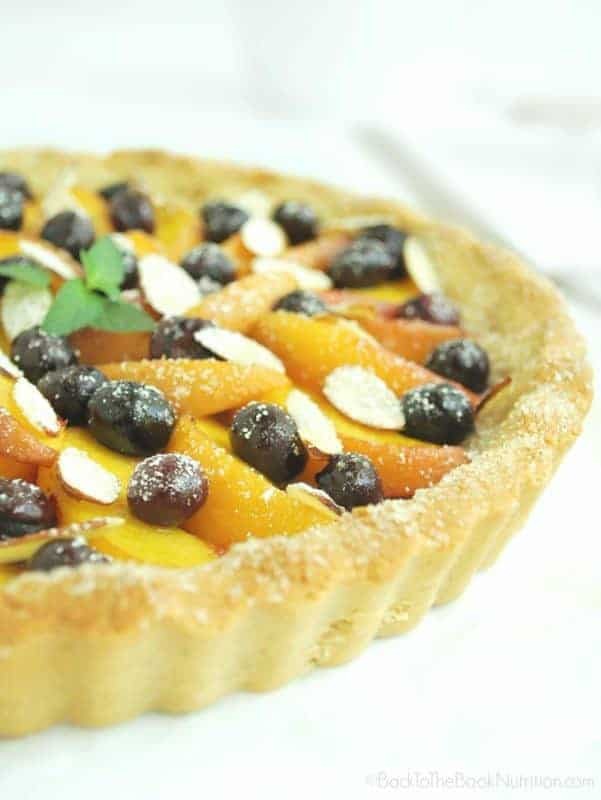 Arrange the peach slices around the tart shell, then pour the blueberries and remaining syrup mixture into the baked tart shell (still on the baking sheet). Sprinkle sliced almonds over the fruit mixture. Use a pastry brush to brush the reserved melted 1/2 Tbsp butter around the edge of the pastry crust, sprinkling granulated sugar or maple sugar on top if desired. Bake for 15-20 minutes or until fruit is soft and crust is a light golden brown. Allow to cool completely before slicing and serving with desired toppings. 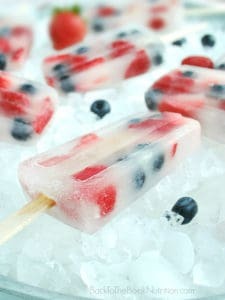 Here are a few other favorite summer fruit recipes!